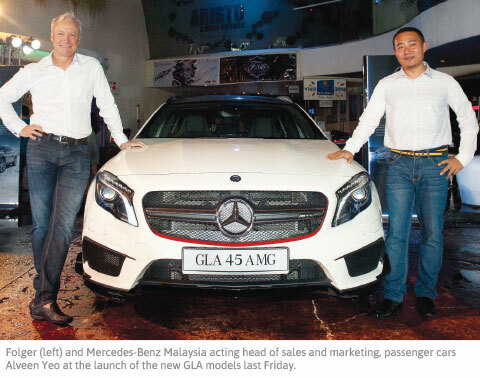 KUALA LUMPUR: Mercedes-Benz Malaysia Sdn Bhd aims to tap into new customer segments by introducing the all-new Mercedes Benz GLA-Class in three variants (GLA 200, GLA 250 and GLA 45 AMG). Mercedes-Benz Malaysia president and chief executive officer Roland Folger said the new compact GLA will add diversity to the Mercedes-Benz portfolio. “The success of the new compact vehicles is an important element of our strategy for the future. With the compact GLA, we add another attractive sport utility vehicle variant to the Mercedes-Benz model portfolio on this constantly growing segment,” he said in a statement. “The GLA impresses mainly with its progressive character and agile handling. I am very confident that with its fascinating design and high everyday practicality, the new GLA will fill many new customers with enthusiasm for our brand,” he said. Folger noted that with a wide-ranging model portfolio, the company will be able to target new customer segments and also enable further purchasing opportunities for Mercedes Benz cars at a competitive level. “There is a healthy demand for our vehicles. Even with the impending goods and services tax, which will not impact our customers directly, we believe that there will be growth in the economy,” he said. “Mercedes-Benz Malaysia continues to be a committed investor in the local market and will continue to maintain the value of our vehicles and after sales service for our customers,” he said. With five model series (GLA, GLK, ML, GL and G), Mercedes-Benz Malaysia offers the widest range by any European premium manufacturer and meets all the individual mobility wishes of its customers. The GLA has a flexible and variable interior, with rear seat backrests that can not only be folded down completely, but is also adjustable for angle if required. Two lines are available in Malaysia, the “Urban” on the GLA 200 and the “AMG Line” with “Night” package on the GLA 250. The GLA 250 will also be available with the new generation of 4MATIC all-wheel drive featuring fully variable torque distribution. This article first appeared in The Edge Financial Daily, on November 12, 2014.